Earlier this month, I released the first of a series called Noah's Christmas Ark. (Please go backwards a few posts to see all the information on the whole series, as well as the details for if you'd prefer to stitch all twelve blocks on one piece of linen.) I don't know that I'll actually stop at twelve blocks for sure, but at least for 2018 that's what is lined up. My friend Pat Ryan is stitching all of them for me as individual ornaments, and at the same time, she's stitching them all on one piece of linen for the shop. I can't wait to see it when it's finished! Weeks Dye Works in Bullfrog, Parchment, Garrison Green, Kudzu, Grapevine, Molasses, Baked Apple, Galvanized, and Crimson. These charts are cross stitched over two linen threads, and you will back-stitch the honeybees' legs and stingers. The Gentle Art in Old Red Paint, Mulberry, andds used: Maple Syrup. Weeks Dye Works in Bullfrog, Charcoal, and Sanguine. Stitches used in this design are cross stitch over two linen threads; the motto on the bottom is stitched over one linen threads, and the flower stamens are long-stitched. Weeks Dye Works in Blackboard, Driftwood, Parchment, Sanguine, Garrison Green, Grapevine, Onyx, and Chrysanthemum. Classic Colorworks in Deep Fennel. 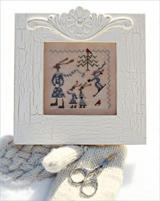 Stitches used for Soul Sisters are cross stitch over two linen threads, and cross stitch over one linen thread on the friends' faces and hair. The frame is by Sherri Berkman of Total Framing in Fairfax, Virginia, and Pat Ryan came to the rescue again on the model! Classic Colorworks in Clay Pot, Hazelnut, Stepping Stones, Wasabi, Rose Petal, Antique Lace, Sunkissed, Pine Needles, Cappuccino, and Hickory Sticks. Weeks Dye Works in Bee's Knees (new for market! ), Charcoal, and River Rock. This design is stitched in cross stitch over two linen threads, and a tiny bit of over-one stitching on the queen bee's shoes and crown. There is also some long-stitching on the bees' wings, legs, and stingers, and a back-stitch for Babushka's lips. The frame (love this moulding!) is by Sherri Berkman of Total Framing in Fairfax, Virginia, and the model was stitched by Deborah Bixby! On deck for the near future is Noah's Christmas Ark III, and I honestly have no idea what else. I'm working on it though! Thank you again for stopping by my blog... I know in this fast-paced, instant world we live in, it's hard to settle down to read a blog post, but I do so appreciate your taking the time to do so. It means so much to me! My blog, though mostly neglected in the past few years, has always been a place for me to settle in and feel like I'm really talking to friends. So I am grateful to you. In the past, I have shared with you my love for coffee and crowns, but until recently, I don't believe I've mentioned my love for cows. Classic Colorworks in Black Coffee (the first run of charts has Black Crow listed, but this is incorrect! ), Toasted Marshmallow, Pine Needles (new for market! ), Joshua Tree, Cinnamon Toast, Red Currant, Used Brick, and Jakey Brown. It also uses DMC in 754. There is mostly cross stitch over two on this chart, but the crows' faces are stitched over one thread, as well as a tiny bit of grass and Bovinia's eyes. 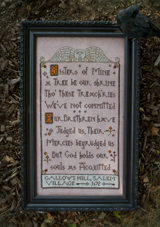 The frame is by Sherri Berkman of Total Framing in Fairfax, Virginia, and the model was stitched by Katrina Devine! Classic Colorworks in Black Coffee, Frosted Sage, Prairie Grass, Eggshell (2 skeins may be necessary), Pine Needles, and Joshua Tree. Weeks Dye WorksBark and Baked Apple. The Gentle Art in Tin Bucket. Stitches used in this design are cross stitch over two threads, with cross or ten-stitch over one thread on the mini cows' eyes and noses. You'll also have a little long-stitching on the bucket's handle, and a tiny back-stitch on the milk maid's mouth. 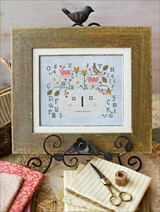 The frame is again by Sherri Berkman of Total Framing in Fairfax, Virginia, and Katrina Devine was the model stitcher! Thank you, Katrina! Classic Colorworks in Persimmon, Bunny Honey, Pine Needles, Weeping Willow, Cinnamon Toast, Blushing Beauty, Hickory Sticks, and Tennessee Red Clay. DMC in 640, 822, 950, 310, 3829, and 3813. Stitches in this design are cross stitch over two threads, as well as a few tiny areas of over-one stitching (Woolemina's eyes, the bee, and the tiny heart). There is also a little long-stitching on the bee's wings, legs, and stinger. This chart was originally intended for a Wilton's 4.5" tart pan (like all the other Jack's Sweet Shoppe patterns), but at the last minute, I decided I wanted to frame it instead! 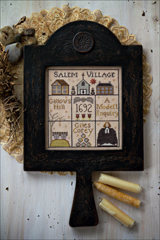 So Nataly Koplovsky, the model stitcher for this design, suggested the Etsy shop called Signed and Numbered, and I was immediately smitten with their frames! I chose the 4x4 Circle Opening Frame in the color White, with the finish Vintage. By the way, Nataly also named this chart. :) Thank you, Nataly! Those are the first three designs! I'll be back shortly with the remaining four. :) Thank you for stopping by, and have a great Monday! I sort of really like George Washington. I'm just sitting here trying to wrap up my second Flosstube video, so I thought I'd pop in here and share a few pictures I took while I was at the Dyeing to Stitch retreat in Virginia Beach last weekend. The last time I visited the shop, there were hundreds of models to look at.. and this time, there were hundreds more! I am shocked and amazed at how many models Ann and Pat and their team manage to fit into the shop - every single square inch of space is inspiring! Some of these you may have seen from the last time I was there, but I loved them enough to re-take their pictures and share them again! I had such a fun time with Beth.. if you haven't checked out her new The Gobbler pattern, it's adorable! One of my favorite memories was when Beth gave a few of us a "dramatic reading" of the story of The Gobbler on the back of the chart - a story, by the way, that came from her own imagination... It was a lot of fun listening to her read it! I think I'll leave off with that for now, and pick up for part 2 soon! I used to be an early riser. For years it was 5 am, and then I went through a phase of 3:45 that I didn't love much, but grew to. This year I suddenly joined the 6:30 club, which I also don't care for, because I generally feel that by 7 am, my day is half over. I am happiest in the zero-five-hundred-hours range. This morning I woke up at my beloved 5:15, which has given me lots of ambition for the day. And that translates to another blog post, right on the heels of yesterday's post. That never happens! So here I am, coming to you with information about my latest releases, as well as a chart error or two that I've been made aware of. A Thousand Hills... I posted about this one on Instagram, bc I've recently fallen in love with bovines. Katrina Devine stitched this (as well as converted the DMC palette to beautiful overdyed flosses), and her little granddaughter Ellie seemed to enjoy watching her stitch it, which made me smile. It made me happy that Sophie immediately claimed the sampler for herself - which also never happens. The linen used for this sampler is 36 ct. Winter Brew by R&R Reproductions, and the threads used are Classic Colorworks in Tennessee Red Clay, Deep Fennel, Egg Shell, Sunkissed, Pea Pod (2 skeins suggested), Avocado, Hickory Sticks, Ye Olde Gold, Cinnamon Toast, Black Coffee, and Red Currant; Weeks Dye Works floss in Schneckley and Havana. The stitch count is 156w x 194h, and it is mostly cross stitch over two linen threads, with the tiny black birds stitched over one thread. Berry Cottage... This one is sort of a follow-up to A Red Cottage, released a few years back. At first I had this dubbed "A Plum Cottage," but something about it wasn't working for me - and that's when I realized it was the color. So I changed it to a rosewood color, added some berries, and found I liked it much better! This model was stitched by the delightful Penny Houser, and the linen she used was R&R Reproductions' 36 ct. Patriot's Brew. The colors used were Classic Colorworks in Tennessee Red Clay, Used Brick, Bunny Honey, Weeping Willow, Muddy Puddle, Cinnamon Toast, Blackbird, and Red Currant; Weeks Dye Works in Sandcastle and Schneckley. The stitch count for Berry Cottage is 112w x 83h, and it is stitched mostly in cross stitch over two linen threads, with the miniature cottage stitched over one thread. Judge Not... I almost didn't release this one! I just wasn't sure if it was going to be a keeper when I sent it to Penny to stitch, but when I got the model back from Sherri (the Fabulous Framer at Total Framing in Fairfax, Virginia), I kind of liked it! This was stitched on 36 ct. Stars Hollow Blend by R&R Reproductions, and uses colors by Classic Colorworks in Shabby Sheep, Muddy Puddle, Tea and Biscuits (don't you love that name? ), Whatley Woodlands, River Rocks, Blackbird, Bunny Honey, Hickory Sticks, Cherry Cobbler, and Toasted Marshmallow. 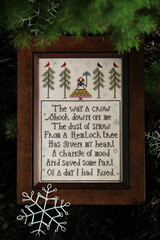 The stitch count is 223w x 91h, and it is worked entirely in cross stitch over two threads. Sampler House III... I've been asked how many will be in this series, and I'm not quite sure of the answer to that. I had originally decided on five, but when I decided to release them in pairs, that turned to six, and if I come up with any more ideas, then that will turn to eight, and if I find that I've awakened at 3:45 again one of these mornings, that will turn into ten, and so on. You get the picture. Pat Ryan stitched this model on 36 ct. Stars Hollow Blend by R&R Reproductions. The threads used are as follows: Classic Colorworks in Antique Lace, Blue Corn, Hickory Sticks, Blackbird, and Ye Olde Gold (on the key on the chart, I accidentally forgot to indicate that those last three colors are by Classic Colorworks also); Weeks Dye Works in Lancaster Red and Garrison Green (my new favorite green); The Gentle Art in Schoolhouse Red. The stitch count is 98w x 99h (all of the Sampler Houses will be approximately the same size, by the way), and it was worked entirely in cross stitch over two threads. The finishing was done by the talented Joy Hayward of Finely Finished. Sampler House IV... Katrina Devine stitched this fall-themed house, and I love the colors she chose to convert to for this one as well! 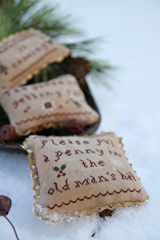 The model was stitched on 36 ct. Winter Brew by R&R Reproductions, and these are the threads used: Classic Colorworks in Olive Branch; Weeks Dye Works in Tiger's Eye, Havana, Terra Cotta, Caper, Grapevine, Charcoal, and Schneckley; The Gentle Art in Mulberry. The stitch count for this is 98w x 99h, and the chart is worked entirely in cross stitch over two linen threads. This one was also beautifully finished by Joy Hayward of Finely Finished. And there you have it! Those are my releases for this month! I will be pre-releasing some new things at the Dyeing to Stitch retreat in September, as well as the Shepherd's Bush retreat class piece, Heritage Sampler. (Pat is busy working that onto a piece of 36 ct. Olde Towne Blend.) Then in early October, that set will begin making their way to your local shop. Thank you so much for stopping by! I'll return soon with more of the long weekend in Tulsa! My goodness, where have I been?? I'm so sorry to leave you hanging like that! If you haven't given up on me just yet, let's continue our tour! I hope you enjoyed this brief second half of the Silver Needle Tour! I'll be back soon - I promise this time! - with more photos from my five-day-weekend in Tulsa, which includes a visit to the Pioneer Woman Mercantile in Pawhuska. Last week I was in Tulsa, teaching with my sweet friend Linda from Chessie and Me at the Silver Needle Summer Stitching Event, and what a fabulous time we had! Lindy and her team did a wonderful job, and I was really overwhelmed with how welcoming every single person was. What a huge group of attendees! And we all had fun chatting, stitching, eating, laughing - all the good stuff! Just around the corner from where we were gathered was the Silver Needle shop itself, and I thought I'd give you a little look-see, in case you've never been! (And if you're ever passing through the Tulsa area, you have just got to stop in and visit!) I took a lot of photographs last week, so I'll need to break up the blogging into a few different posts. If you see something you like, give Lindy a call, and she'll be happy to help you out! I'll stop here for now, but I hope you enjoyed the first part of your mini tour! I'll try to get back here soon with the rest of the shop pictures and a few from the actual retreat itself. And by the way, Sabrina drove up from Dallas and arrived during the last half hour of the fun - just in time to help tear down and clean up! But afterwards, she and I spent the next couple of days doing a few things around Tulsa, and then driving up to the Pioneer Woman's Mercantile. And let me tell you.. I was in caffeine heaven!